Mascot Recycling Ben congratulates students at Dawnville Elementary School for winning a recycling award. Target Recycling at School takes the Target Recycling program a step further by providing a comprehensive Environmental Education program that encourages schools to be more environmentally friendly and green. This free program is available to the 36 public and private schools in Whitfield County that participate in Target Recycling. Click here to download the pdf guide for 2018-2019 year. This guide includes a brief overview of the services provided by Target Recycling at School, a simple list of what can be recycled at school, and the guidelines for this year's school recycling contest. Click here to download the PDF guide for the design contest. Submissions due October 15, 2018!! Exclusively for teachers and school representatives. Register to stay up to date with the school recycling program. You'll receive monthly recycling rate reports, and useful environmental education news. Click here to view the current Target School Recycling report and view the top schools this month! Target Recycling offers three different collection containers for specific recyclable materials: Mixed Paper, Cardboard Only, and Plastic & Aluminum. Each school has a different combination of containers available. However, all schools are recycling at least Mixed Paper, which includes flattened cardboard boxes, newspaper, copy paper, books, posters, construction paper, homework... if it tears it's ok to recycle. If you have the Plastic & Aluminum container, and use the blue Away From Home bins inside your school, you could also download and print the mini poster from the Special Event Recycling page. Not sure if your item can be recycled at school? Call the recycling center at 706-278-5001 for help. Catch the Cycle is a guide to recycling in Georgia Schools, from waste audits to collection. While Target Recycling at School provides the collection container(s) outside of your school, it's up to your team to decide how to handle collection inside. Each school does things a little differently depending on their needs. Typically each classroom has a recycling bin or box for mixed paper along with a trash bin. Teacher work areas, offices, and break rooms also have recycling bins. The gym or cafeteria may have a collection bin too. Some schools have temporary recycling bins outside for sporting events. When those bins are full the custodial staff may empty them and take the contents to the recycling container outside. Some schools allow students on the green team to collect recyclables as part of their ongoing activities. The downloadable PDF booklet, Catch the Cycle, is a great place to start if you're managing the recycling program for your school. A limited number of print copies are available. Call 706-278-5001 or e-mail: lswafford@dwswa.org to request a copy to be mailed to you at no charge. A second guide, not pictured, from PaperRecycles.org is also a great resource to read. Download the School Recycling Guide from their resource page for free. Include recycling reminders in the daily announcements, and school assemblies. Have students decorate their classroom recycling bins, have a contest. Design your own recycling posters, and labels for bins, featuring your school's mascot. Print articles about recycling in your school newsletter, paper, or website. Send letters home explaining the recycling program to parents. Have an in-school recycling contest where grade levels can compete. Share recycling successes with the PTA/PTO participants. Promote recycling during Earth Day, April 22 and America Recycles Day, November 15. Take a field trip to our recycling center, check out the Environmental Education Program. Invite Recycling Ben to go to your school for an assembly or class visit. Let everyone in the school know what can be recycled using Recycling Ben's activity sheets. Download them for free and make as many copies as you need. 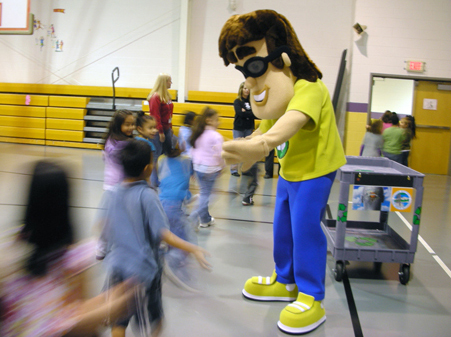 Mascot Recycling Ben gives a student at Cedar Ridge Elementary School a hi-5 during a class visit. In 2004, the Authority partnered with two County schools for pilot recycling projects. Southeast High School’s special education classes partnered with the Authority for the first pilot project for school recycling. Southeast High School and its “Recycling Raiders” continue to set the bar for the other participating schools within our program. By 2009, the Authority had expanded recycling collection programs to all 30 City and County schools. Authority staff developed monthly newsletters to be sent to the schools to inform the staff and students of the schools progress for the month and report the amount of material received from each school.